Yoshka's big achivement at this specialty was to FINALLY earn his first Open leg. He did it in style! 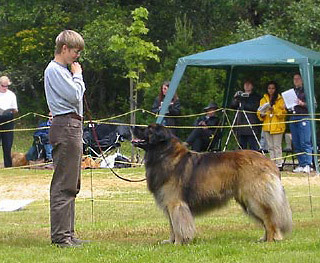 By putting on one of his best perfomances ever, he scored 194 points out of 200 (a couple of the points deducted were because of handler error ;-) and took High in Trial at the same time. The next day Yoshka also did well in the confirmation ring, placing 4th in the Champion Class with an Excellent rating. A truly versatile Leonberger! Huge, beautiful coat with a warm color and nice shades of black. Good mane but mainly huge feathers and pantaloons. This is the ideal we should have. Nice expression, but slightly feminine and narrow for a male. Excellent pigmentation of gums. All teeth are there, but bite is not ideal because of misaligned lower incisor (but still acceptable). Nice and straight. Croup is slighly too sloped. Well set and carried while standing. Tail is slightly happy. Hocks are well parallel, but slightly close. Front is slightly crossing. Very easy mover. Step could be a bit longer. In general movement should be a bit more masculine and strong with more drive.